The use of weighted blankets in the elderly is quite common these days, but are those blankets actually effective in Alzheimer’s and dementia care? When a loved one reaches that age when things start going uphill in their mind, the only thing we can do is provide all the support and love we can, making them feel comfortable, and enjoying that stage of life where family truly becomes the driving force in their life. This becomes incredibly important for those afflicted with diseases such as dementia. While there's no cure for dementia, the rightful care approach can help the elderly have a better quality of life. Let’s take a look into how weighted blankets can be helpful to adults with Alzheimer’s and how to use them correctly. 3 Are Weighted Lap Pads Helpful in Alzheimer’s and Dementia Care? 6 How to Make a Fidget Quilt? Alzheimer's disease is the most common kind of dementia, and it is not kind, at all. Alzheimer involves cell death and tissue loss in the brain, and the early symptoms include a decline in language ability and cognitive function. If cared wrongly, Alzheimer's disease can lead to a development of other stronger kinds of dementia. Dementia involves several conditions related to the loss of cognitive functioning. Apart from Alzheimer's, dementia has some other types, such as Parkinson's, Huntington's, and Creutzfeldt-Jakob diseases. No treatments exist to slow or stop dementia development caused by progressive dementias, or neurodegenerative diseases. However, experts claim the quality of life highly depends on the level of care that the person receives. Both Alzheimer’s disease and dementia, cause adults to feel anxious and agitated, or suffer from sleep disorders. Certain drugs help to alleviate these issues, but sometimes they can do more harm than good. Sensory stimulation is a proven drug-free way to improve sleep, combat anxiety, and calm nerves. It’s so simple that you can generally find the objects you need to experiment with it around your house, that can provide a wide range of stimulation to all the five senses. 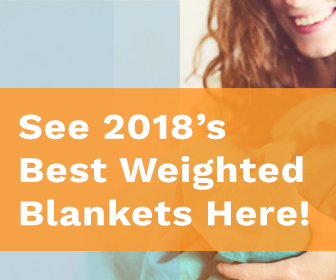 There are also many products you can buy that are focused on helping with sensory stimulation therapy, like weighted blankets and weighted lap pads. Many caregivers apply the use of weighted blankets in the elderly as a way to help to ward off anxiety and alleviate sleep disturbances often associated with dementia. There are also the called "fidget blankets", which are made to provide a diversity of activities, by containing charms and trinkets within the reach of the patient. Alzheimer’s fidget blankets are particularly useful as they help to keep the hands busy in a soothing and safe way. But let’s talk about the pros and cons of weighted blankets and weighted lap pads first. 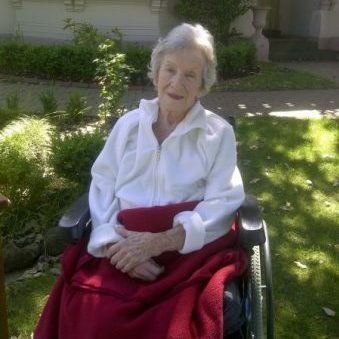 Weighted quilts in Alzheimer’s and dementia care have their benefits and also some drawbacks. Although they’ve been scientifically proven to reduce anxiety, they’re not for everyone. The key is to choose the right weight, as a too heavy blanket can cause discomfort and even injuries on the most delicate patients. Weighted blankets for adults with Alzheimer’s must not be more than 25 pounds. They must be about 5% to 10% of the body’s weight. Be sure to consult a doctor before choosing the blanket. Due to deep pressure therapy, a weighted blanket helps to feel calmer and fall asleep faster. There are patients with Alzheimer’s disease who claim that heavy quilts help them take a quality nap in the afternoon. Other patients use the blankets to reduce the mood swings and panic attacks as well as prevent them from overthinking about their disease, unless they don’t understand they have it, this is called anosognosia1. However, the use of weighted blankets in the elderly is something that has to be done with caution. As these aren’t recommended for people with serious medical conditions, such as temperature regulation, circulatory, or respiratory issues. Some patients may feel irritated every time someone places something heavy – be it a blanket or lap pad on their body. Because of this, when planning to use weighted blankets in dementia care, it’s important to experiment first with low weight objects, before investing into the heavy quilt. If you want you can read this article to get some ideas. Are Weighted Lap Pads Helpful in Alzheimer’s and Dementia Care? Unlike heavy quilts, weighted lap pads are safer, as they aren't used while sleeping. Again, it’s critical to choose the correct weight, which is usually from 2 to 5 pounds. Thanks to their compact size, lap pads are easier to carry than weighted blankets. Patients with Alzheimer’s and dementia use the lap pads to tame anxiety, eat better, and boost their concentration. My grandma who has been suffering from Alzheimer’s for 3 years has fidgety hands, which don’t allow her to eat properly. Just as most people with this disease. My mom made a 4-pound weighted lap pad, which my granny uses during meal time. We see that it significantly calms her down and she eats much better than when she doesn't have it. As an avid reader, my granny also uses the lap pad during her short reading time. Even though it doesn’t work all the time, a tiny help is still something nice. Fidget blankets help people with Alzheimer’s and dementia to stay occupied and thus feel calm and relaxed. This activity blanket stimulates memory, increases awareness, and boosts mood. The clever thing is that you can add weight to a regular fidget quilt or fidget mat, to make it the ultimate solution for those fidgety hands and the anxiety that your elderly loved ones can often feel. When dementia progresses, patients tend to experience a drastic decrease in the brain function. Moreover, they begin to communicate poorly, and lose the ability to do the simple daily activities. This leads to tons of stress, frequent mood swings, and even depression. Fidget quilts give seniors with dementia the chance to unleash their potential and express themselves with no words. This helps them feel joyful, relaxed, busy, and secure. The activity blankets stimulate, engage, and calm the brain with various textures, forms, sizes, and shapes. When these rules are followed, fidget quilts might not have any side effects. In rare cases, patients with dementia have been reported to feel irritated when using an activity blanket. People with Alzheimer’s or dementia usually show agitation or anxiety through their fidgety hands. This may be rubbing or pulling the hands at bedding or clothes, twisting fingers, rubbing the hands together, or wringing them. Fidget quilts keep the hands in motion but in a calmer way. My grandma likes to touch small items like coins, buttons, and beads. She can roll them around between the fingers for hours. But we’re afraid of a choking hazard, so we give her the lap pad with her favorite items tightly secured to it. Not only does it keep her hands busy for hours, but also lifts her spirit and mood instantly. Fidget quilts can be big enough to lay across the laps, a compact size for car trips, or in a form of a mat. A fidget mat is the size of a regular placemat and it usually includes pockets, buttons, zippers, bells, strings of beads, and other items. It may also have a vinyl pocket for family photos or a textured pocket for a soft toy. Fidget mats help to exercise hand muscles, stimulate senses, and focus attention. Plus, they’re amazingly entertaining. Fidget mats are often sewn to the top of the weighted lap pad for a stronger calming effect. How to Make a Fidget Quilt? Start with making a simple yet entertaining DIY activity blanket that requires minimal sewing. Grab a large piece of soft fleece or fluffy bath towel and securely sew on a diversity of items. If you want to make a DIY weighted blanket and then transform it into a fidget mat you can read about that here. Weighted blankets and lap pads, as well as fidget quilts, can significantly relieve the symptoms of Alzheimer’s and dementia. But remember, no matter how those tools are helpful and entertaining, make sure you still supervise a patient or someone supervises you.